This project investigates a new sensor architecture for making interactive surfaces that are sensitive to human hand and finger gestures. This sensor recognizes multiple hand positions and their shapes as well as calculates the distances between the hands and the surface by using capacitive sensing and a mesh-shaped antenna. 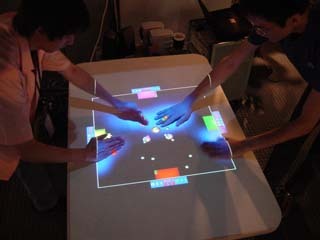 In contrast to camera-based gesture recognition systems, all sensing elements can be integrated within the surface, and this method does not suffer from lighting and occlusion problems.